Top rail designed to match AR15’s height over the stock comb for comfortable sight picture, a small side rail and a hollow forend with integral weapon light: all made by my friend Paul’s Gear Head Works. 9mm Tavor conversion is fun to shoot. Mepro 21M sight turned out to be too bright for small targets but works very well on full-sized silhouettes. This entry was posted in rifle, weapon and tagged 9x19, bullpup, IWI, red dot, Tavor. Bookmark the permalink. Holy crap! Is the subject even 5′ tall? 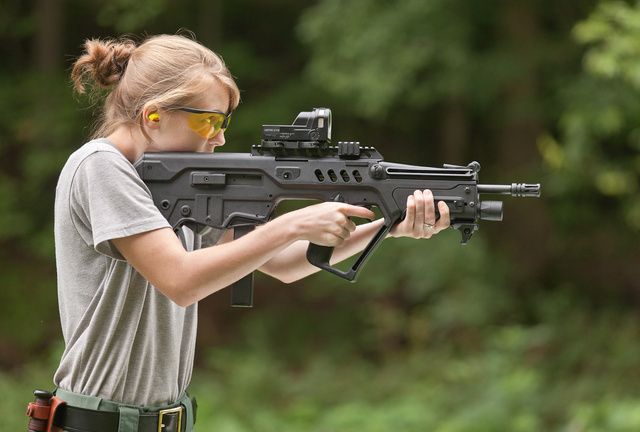 The Tavor looks huge in her arms. I wonder if she’d like the length of pull on an MTAR or X95 better. Gear Head Works’ TMF and FLEx have been on my list of must-haves for the SAR. This very much tempts me to get one for my wife.